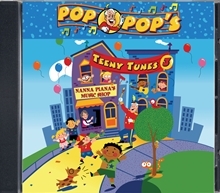 Take your little sailors on a magical tour of Teeny Tune Town with over 25 sing-along songs on CD, recorded in split-trax format. Your toddlers will have the time of their lives as they join the parade with Pop Pop, Nanna Piano, and friends. $0.99 10. Why Do I Have to Rush? $0.99 11. Do You Have to Cut My Toenails? $0.99 15. Where Does It Hurt? $0.99 18. That Isn't Fair!